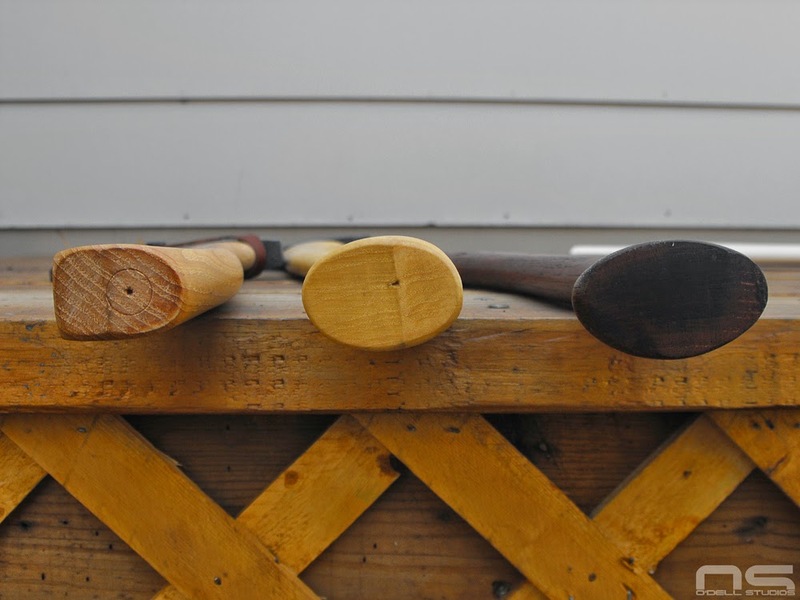 This comes up so often that I think it's time for a post on axe handles for those looking to restore, refurbish, rehang an axe for the first time, or second, or third. If you've taken the time to do any research at all, chances are you have heard of House Handle. They cater to axe enthusiasts. 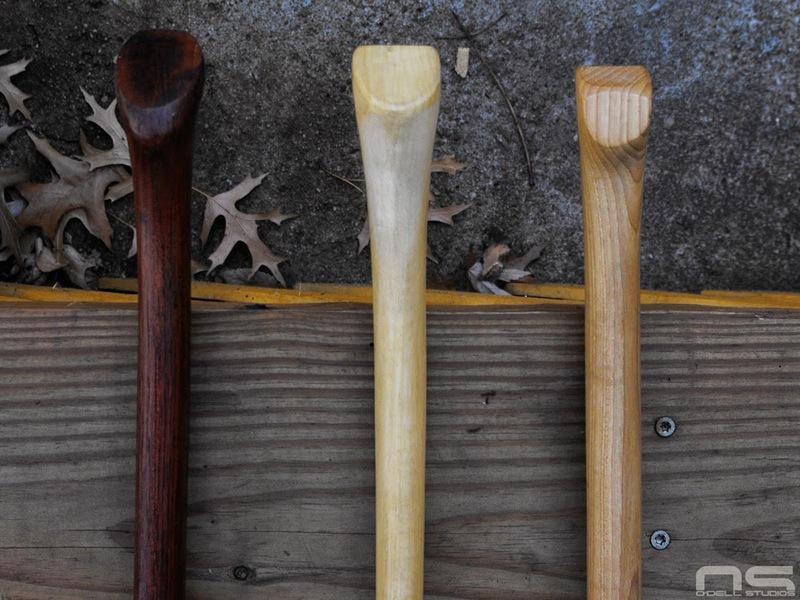 That I can tell, there are 4 to 6 places making handles and you can get most of them in big box stores, or through a retailer of some sort, but none of them will hand pick you a stick. None of the manufacturers ship to individual customers in house (Baker might). Except House. 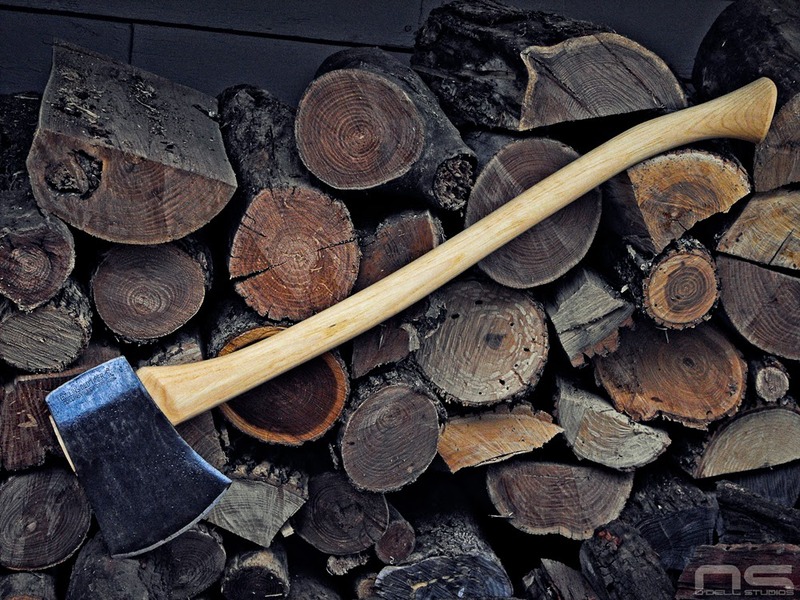 Combine this fact, with the availability of 28, 30 and 32 inch curved handles for full sized single bit axes, and House Handle is the only game in town. These are the reasons for ordering from them, not necessarily the reasons most people think of. But, before I go any further, I feel the number one topic that needs to be covered is expectations. Grain runs fully across the handle creating weakness. Why expectations? Well you have to ask yourself what you want to accomplish with your axe. If you've been reading forum threads or watching how-to videos, then the aspect that you probably hear constantly repeated is what you should look for in a handle. 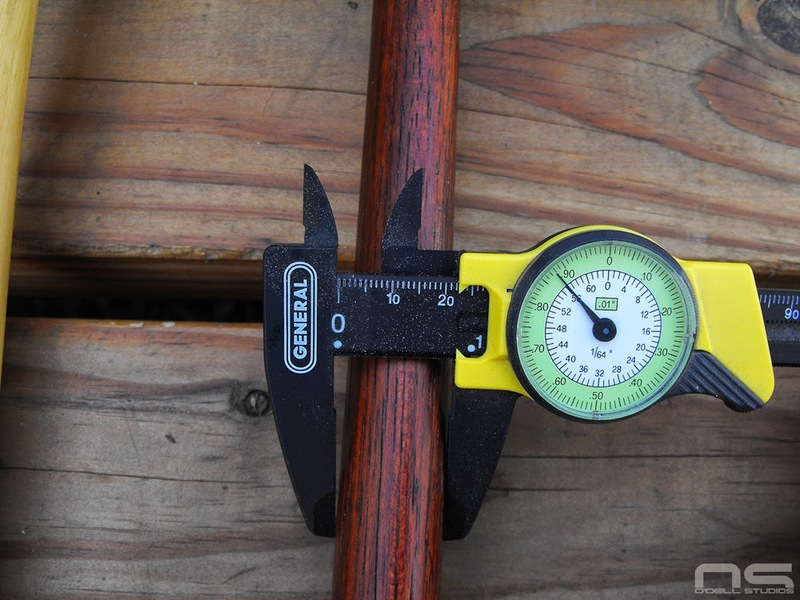 Ignoring all those things, if you want a 30 inch handle for your axe you aren't going to find one in a hardware store. If you do, you are lucky and that handle is probably from House - congrats, you get to see your handle before you buy it. If that isn't your scenario then you are going to order one. So with all the talk of what to look for in a handle, you have been unwittingly given false expectations. Why? Because that handle simply doesn't exist. If you don't particularly care about the handle, then you will be perfectly satisfied with what is available and let me tell you, you will have a perfectly serviceable axe, regardless of the "rule" violations that handle may commit in the eyes of certain experts. If you've wrapped your hands around a handle from 50 or 100 years ago and you want to get something like that, then you should accept, before you place your order, that you will not get a duplicate of that handle, no matter how much you pay for it. [Editor's note: I am inserting this exception for the next few weeks when I have my hands on an less known handle maker's product in hopes that I can be proven wrong.] Why will that handle not be perfect? It's simple in my eyes. 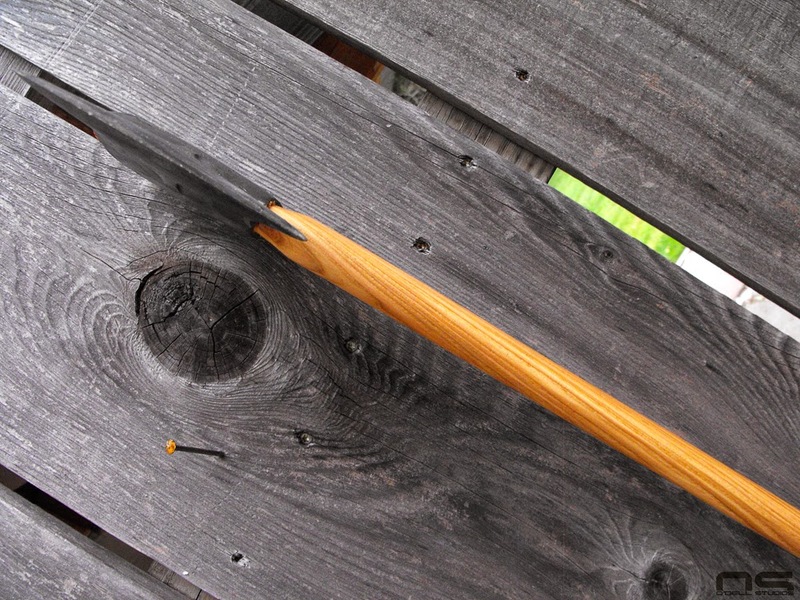 Wooden handle tools can be described as a dying industry, and when compared to the decades past when hand tools where the only tools, it is all but deceased. Couple that with the American workforce costs, where a person can't possibly charge a fair price for a product with the amount of handwork that went into tool handles 100 years ago, and still pay his employees a living wage. I doubt they can even afford the lathe time, because those old lathes aren't fast - see them in action here. The bottom line is, expect to do some work to your handle when it arrives. In fact, there might even be some imperfections. It's not that I'm saying this is how things should be, I'm just saying, here is what you can expect. Handles might have some slight bend, less than perfect grain orientation, or lack some of the other features that supposedly constitute a perfect handle. So that covers expectations, now here is how I operate, and how you can get the best available. Again, most of us use House Handle because they will hand pick your handle, and they offer 4 lengths of curved handles for full size axe heads. Why is that second part so important? Well it isn't necessarily, however, shorter handles were very common in the yesteryears of axes and for good reason. Portability is an important factor, but for a lot of people a shorter handle just works better. The "boy's axe" handle is made to fit an axe with a smaller eye so for the most part it isn't a good option unless of course you are hanging a boy's axe. If all you need is the standard 36 inch handle, there are some good options. Baker Tools makes nice handles, but I have contacted them directly and they do not make any other length. Their handles are available in Menard's stores. For me, the only important factors to an axe handle are that the grain runs more or less parallel with the tool head, and that there is as little run-out as possible. I don't aesthetically like the look of heart and sap wood mix, and I'd prefer the handle be straight. And you can ask for all of these things when you order. You must request to have your handle hand picked in a comments box during checkout. If you only order a single handle, and request the add-ons, your handle will be about $15.00 shipped. 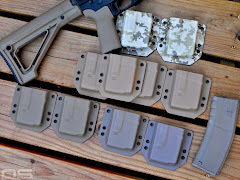 The last topic I wanted to cover is the Gransfors, Best Made, Base Camp X, Council Tool Velvicut, etc. handles on higher priced current production axes. I have a couple Gransfors but never touched a Best Made or the others. If you buy a truly handmade or custom axe, expect good things. However, these current production axes are not the standard by which to judge other handles in my opinion. Gransfors and the other Swedish brands are excellent, but they are not turning handles the way they would have been in America during the height of the axe. They actually have very little swell, which is the enlarged portion at the bottom of the handle. It is often referred to as a fawns foot or scroll knob. These other American companies are sourcing their handles more than likely, the same way you and I are - from some handle maker - and you can see those same products hanging in hardware stores. Part of the point I'm making is, there isn't much out there that can be called the best and if they are, I would consider that an uninformed opinion. I think there might be a little mysticism surrounding Gransfors handles and I stumbled upon a video which shows a modern machine making eerily similar handles (clearly in a different country). The shape is somewhat different, but note the unique marks left by a plainer style blade, the consistency this machine is capable of, and the sort of round organic cross section of the handles. Today, a machine that can produce 4 identical, and virtually complete handles in less than 2 minutes would be ideal. Here are what I consider to be the best videos available for hanging an axe. Everything you need to know can be learned from them, and you can pick up some very important, often overlooked, tips and tricks if you pay attention to the details. An Axe to Grind is one of the go-to videos. There are a few things I don't like, but if you watch only one video, this will get you going just fine. With an Axe and Knife is great because it shows a hand carved axe handle made by someone who lived by his tools. You have to watch carefully but there are some great tricks. For instance, he doesn't cut the handle down until he is finished hanging - it makes popping the head off for fitting much easier. Bringing Back an Axe shows good technique for driving the wedge and a couple trouble shooting tips. BushcraftUSA Bushclass seems to be broken for me, but it's very good and complete. Now, to make this post extra epic, I wanted to throw in my 2 cents on working your handle. Often when your handle arrives it will be a little too big in most dimensions. This is a good thing. If it's not, well I'm sorry, that does happen and I have actually asked for over-sized handles in the past. Once you know a few dimensions you can get a feel for just how big the handle is, even if it may not seem to be. Keep in mind that there were many, many patterns for handles and lots of folks made their own handles to their own liking. A handle, in my opinion, is all about personal preference. This is why you will notice that I refer to the "rules of axe handles" in quotation marks, and use words like "supposedly" when I talk about them. Sure, there are features that may make one piece of wood stronger than another, that's fine. However, there is no overwhelmingly compelling evidence that one shape - straight, curved, or really curved - is better than another. I do believe that one shape might be more useful for certain types of tasks, though again, not overwhelmingly. And finally, no one can tell you that what you like, just because you like it, is wrong. So when I throw out these dimensions, they shouldn't be considered anything more than guidelines. In the following image, I have redrawn the diagram apparently used by the Pennsylvania Railroad System to spec handles. They were rail workers - just a guess - so it's safe to assume they may have had special uses for their axes. 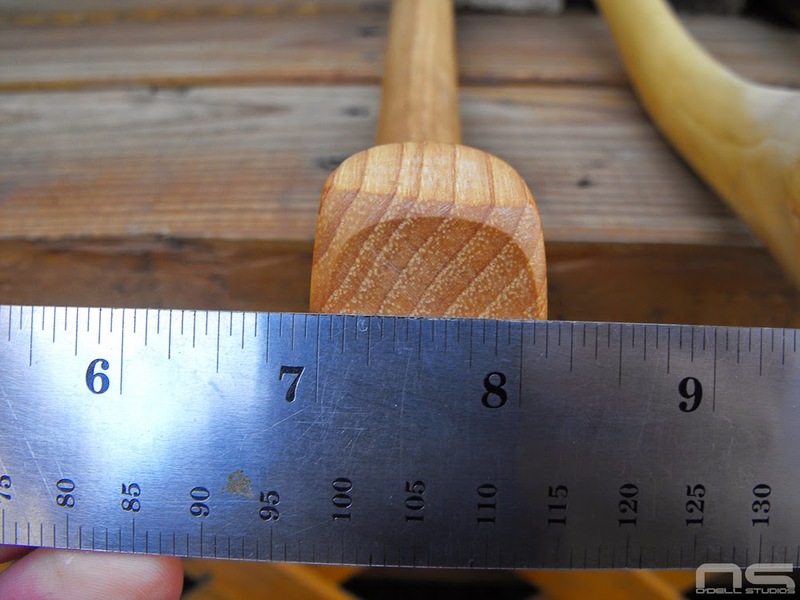 Next up are some images of various handles and some dimensions for reference. The dark, 36 inch handle is old, I believe it may be from the early to mid 1900s and is probably a fair representation of the handles found on typical axes of the time. At the top is my vintage handle, then a cruiser double bit from House, an unmarked head with a House Handle that I did a lot of work to, and finally a Gransfors Bruk Small Forest Axe. Note how thick the new cruiser handle is. You may also be able to see how shapely and sculpted the swell of the vintage handle is. Measurements for reference. On the Gransfors, though it is a small axe, the swell isn't much wider than the main portion of the rest of the handle. Here are the other two. I left as much swell as existed on my handle on the left. Where the vintage handle I would say is fairly slim through the swell for its time. Both are still sufficient and feel great in hand, but I just like a large swell. This best illustrates the swell. 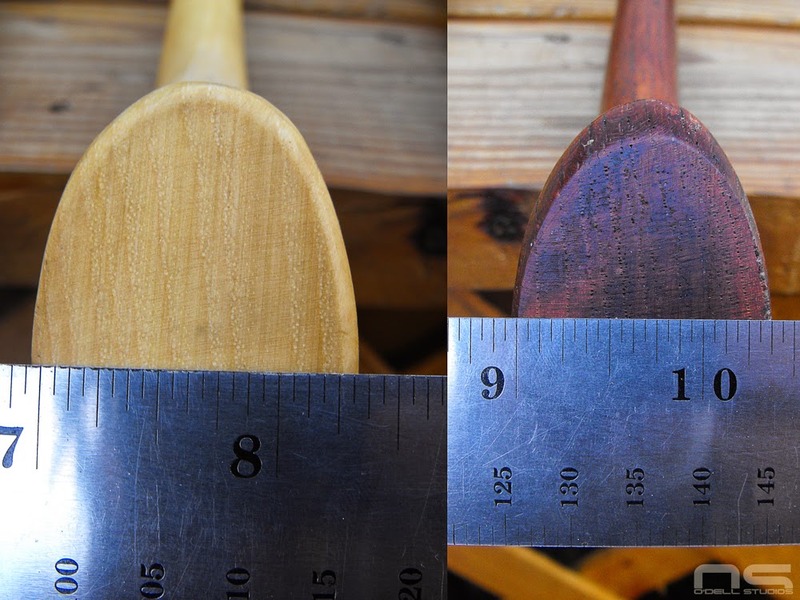 I didn't quite develop the flair in mine (center) when compared to the vintage, and you can see the Gransfors is gentle and only slightly wider than the rest of the handle. So the width of the vintage handle is roughly 7/8ths - just under, which will likely seem pretty slim compared to a handle purchased today. 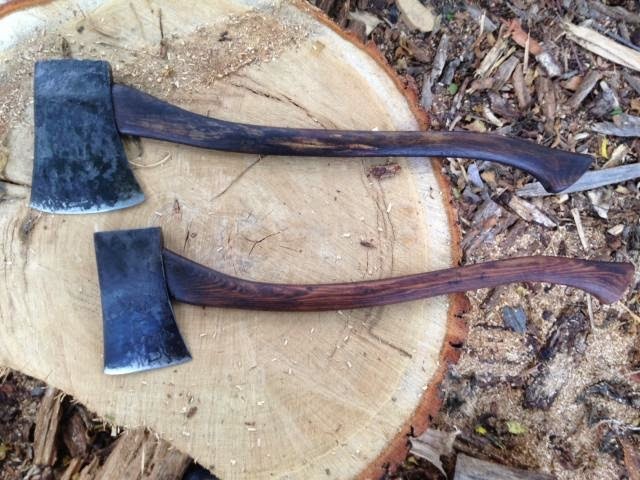 This image, and these axes belong to a BushcraftUSA forum member, but in my eyes, these handles are the best ever made. They have to be very old and this was an amazing pair to find. Note the size of the swell, and the extreme curve in the lower example. 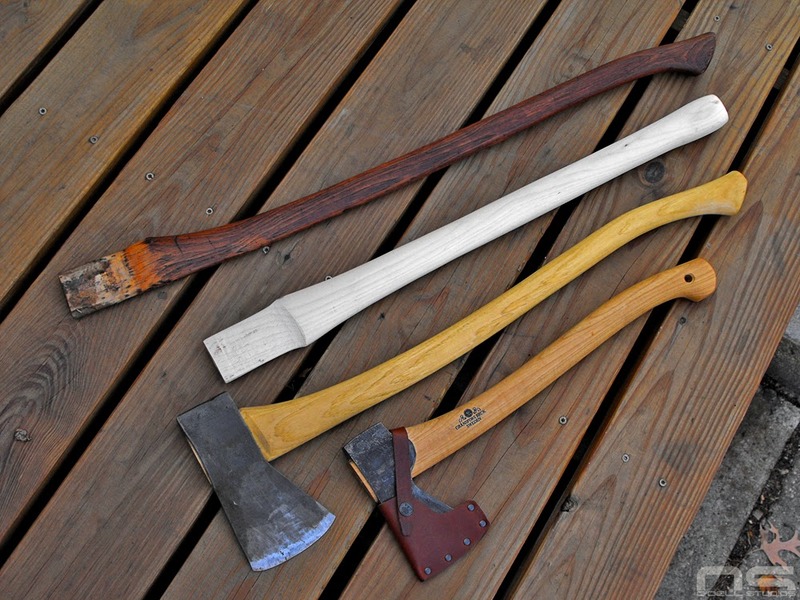 This perfectly illustrates the variety of handle styles that existed and short handles on full size axes. 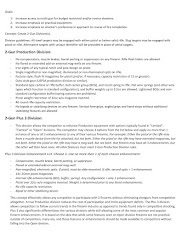 Hopefully this gives new folks some idea of how to get a great feel from your handles and what to expect when purchasing a stick today. My original intention for this post was to show how I have gotten as close to perfection, so far, as I can. However, this post is huge, so I will write a second part covering my experience with a "first pass handle" from House Handle.